Morganton in Western North Carolina, today home of the Fonta Flora Brewery led by its creative mastermind Todd Boera, who gives emphasis to using local Appalachian ingredients in his beers whenever possible. Todd’s vision that ”fermentation is yet another medium for creating art” is much more than just a phrase, it’s the actual ideology behind the brewery. However, what few people outside the US know, is that this area plays an important role in American history. 500 years ago it was a proud mainstay of several native American chiefdoms. Joara being one of them, neigbouring Cofitachequi being another. 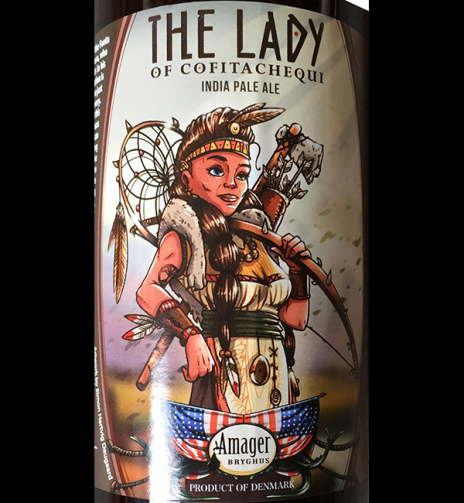 This beer is named after the mythical chieftainness “The Lady of Cofitachequi” who is believed to be one of few – if not the only – female native American rulers. Taken prisoner by invading Spanish conquistadores, on an insatiable hunt for gold, this proud lady managed to escape and rejoin with her people. The invaders built several forts in an attempt to control the area, only to see them all destroyed and burned down by local warriors months later. Only one out of 120 Spaniards is said to have survived. The defeat effectively ended all Spanish attempts to colonize the area. The Lady and her fellow chieftains were again rulers of their own land.